The official launch of Minute Marketing went great – I am so honored and floored by all the support messages I received! I truly have best the best community, friends, family, and boyfriend. Just blessed. In order to keep myself accountable and to hopefully avoid slipping into bad habits, I’m going to start chronicling the weeks of my life over here. The idea being that knowing I have to write these posts will keep me from doing anything I’d be embarrassed to admit that I did (like spend an afternoon binge-watching Shameless instead of working). Saturday I worked for most of the day, but I found time to run a few errands and I took my dog, Elliot, for a walk. I also ran into my neighbors who had some amazing news and I am so stoked for them!! We rent the house we live in, but I love it. I wish it was at least one bedroom bigger, but it’s super cute and we have the best neighbors. I literally picked this place off of Craigslist 3? 4? years ago, toured it, wrote the application that night, and moved into what has been a dream situation. That’s one of the many things I’m super grateful for, after moving so much during college, to have landed in the best situation. And the landlord is awesome, too! On Saturday night, the boyfriend and I finally got around to watching Infinity War. INSANE!! We got dinner beforehand at Rubio’s and it ended up being free because the new guy rang us up and majorly messed up. It almost made us late to the movie which was a little stressful, but luckily I had bought tickets online and this theater lets you reserve your seats. Overall, it was really nice to have an evening off. Sunday, I also worked and then we celebrated Mother’s Day with my boyfriend’s family. My mom lives in Colorado, but I am proud of myself that I managed to sort out the gifts and get them delivered in time with everything else that was going on. I like picking out and giving gifts, so I always handle that. We got Korean BBQ with his family and then we got ice cream at a shop around the corner (Ocean Rainbow) that also served Mexican-style desserts. Monday, I went to the barn bright and early to ride Pia, my younger horse, before going to my old office for a bit to do some training. Then I did some work before tuning in to my Writer’s Group in the evening. My neighbor is in the group, too, but the other members actually live in different states so we hop onto Discord to talk about the pages that were submitted this week. A couple of us have never met in person so I can tell we’re getting more comfortable with each other every week. Tuesday, I didn’t get as much work done because I had some errands and things to do. But I went and looked at new office chairs because the “leather” on my current one is literally peeling off over my kitchen. It gives me anxiety because of how messy it makes the floor look. My office is currently in the kitchen because it’s starting to get warm. Tuesday night I celebrated my friend K’s birthday. We tried a place close to my house that I had never been to before: Gyu-Kaku Japanese BBQ. It was SO good! If you like Korean BBQ, you will like this place. It was a bit expensive though, so more of a special occasion option I think. Wednesday, I also started the day at the barn with Pia. In the afternoon, I met with one of my clients and their new team member. Then I went to the chiropractor who is one of my favorite people because he is a miracle worker. Go see Dr. Brady with Walk-In Chiropractic in Pacific Beach! Thursday, I worked basically the whole day in anticipation of heading to a conference on Friday and Saturday. On Friday, I went to a Facebook Ads workshop in San Diego with Rick Mulready and that was super great! 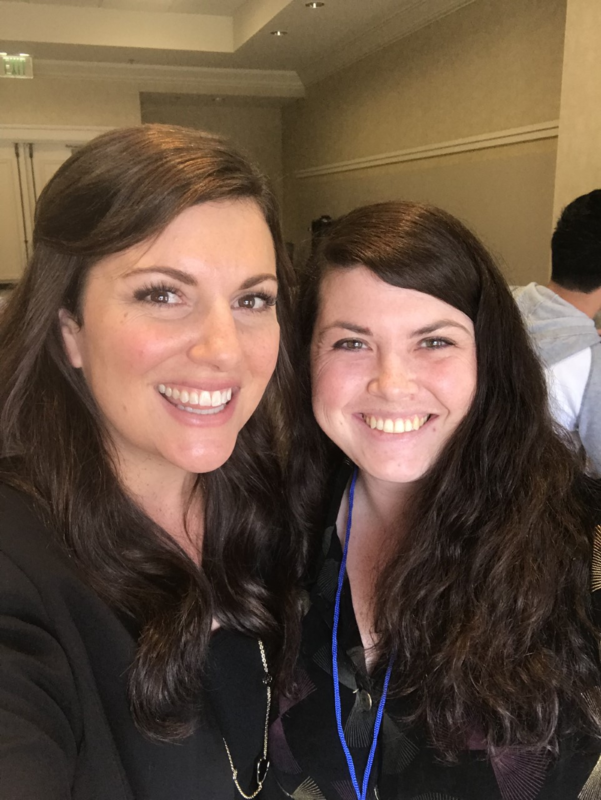 I learned so much and met some great people AND…I met Amy Porterfield. Amy is pretty instrumental in me being where I am right now. When I decided that I wanted to use my marketing skills to help people, I randomly saw this FB ad from Amy for a free webinar she was doing. I knew her name, but I’d never engaged with her content before and I felt like it was a sign I had made a good decision because the webinar topic was spookily about what I had just decided in my head I wanted to do. I did the webinar and I’ve been a fan ever since. That ad was just the first of many spooky beautiful signs I’ve received since then that I’m meant to walk this path. And I’m just so grateful to Amy for continuing to give tons of value to her fans. I pretty much cried when I met her and she let me give her a hug. I was tired after the conference on Friday…I haven’t had to focus on one thing for that long in several weeks. So Friday night I took the night off and the boyfriend and I went to The Crafty Butchers for a sandwich and a beer. The Youpreneur Podcast – Chris Ducker was a guest on a few other podcasts I listen to so I recently subscribed to and started listening to his podcast and I’m OBSESSED. I have been binging on the episodes. Luckily there are a lot of them and I spent a fair amount of time this week driving around. Snow Patrol is releasing a new album, Wildness, and I pre-ordered it through iTunes (yes, I use iTunes) so I have been listening to the singles that have already been released. Also discovered The Killers released a new album last fall, Wonderful, Wonderful, so I downloaded and have been listening to that as well. I actually listened to this (rather than watched) but this video from Sunny Lenarduzzi was gold.